This is a difference equation or recurrence equation, it relates “one value to the previous value(s)”1. It looks deceptively simple, but because it’s non-linear (product of two linear functions), we need to be a little careful with it. We will soon find out how nasty it can become. But before that why is it important? This equation is a population model; xn is the ratio between the actual population and the maximum population, so 0 ≤ xn ≤ 1. λ is a positive factor which combines both ‘birth rate’ and ‘death rate’. 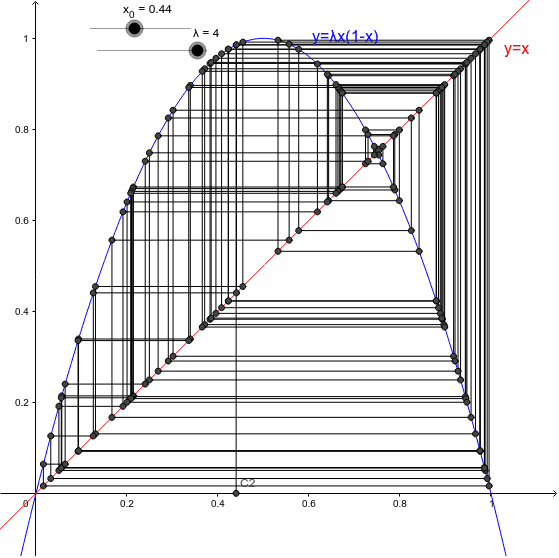 For xn to satisfy its restrictions, we need to restrict λ to 0 ≤ λ ≤ 4. So for example if we found λ of a population, then we could use this model to find out if the population will extinct, settle to fixed number or overpopulate. You can use this to investigate the properties of different points (fixed points, stable points, unstable points). Try to find which are the fixed points, which of the points are stable and which is unstable and when it's stable and unstable. You might need to look at the definitions online or ask your teacher.